The adventures and romance of a sensitive and cultured lion-man and a crusading assistant district attorney in Manhattan, New York City. Catherine and Vincent are forced to question if they could ever be truly happy together. Catherine befriends a boy from the world below who leaves the tunnels to go college. A Russian sailor escapes to the tunnels only to bring a plague upon the people in the Underworld. It is up to Catherine, Vincent, Father, and everybody to help save their world. How many episodes of Beauty and the Beast have you seen? Mouse: Okay good! Okay fine! I found this show by accident one Friday night and became hooked immediately. Here was an intelligent, well-acted program for adults. It was not sexually explicit, nor gratuitously violent. It had something most TV shows do not have: Romance. 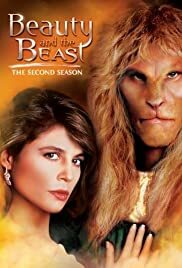 Linda Hamilton and Ron Perlman were absolutely perfect together as the beautiful lawyer who lives above and Ron Perlman as the "hideous" beast whose curse is that he is ugly on the outside and who never gets a chance to reveal his inner beauty until he saves Catherine. Knowing how tormented he was because of his deformities was heart-breaking and yet he blossomed as he and Catherine found real love. Normally, I would be pleased when an actress leaves a show to spend time with her son, as Miss Hamilton did. I'm all for women staying home to be with their children over spending time at a carer; at risk of being hopelessly old-fashioned, I believe women with children should stay home to care for them. However, in this case, it was one of her worst decisions because her marriage to the father of this child fizzled. She later had a child and then married James Cameron of "Titanic" fame, only to lose him to a star of that overblown ocean-going vehicle. She did have success with the Terminator movies but those were nothing but Schwarzenegger fests. Meanwhile B&B also suffered because they just couldn't find a woman to replace Catherine. Diana just didn't have it. The fact that the show lasted 3 seasons (2 with Miss Hamilton) is a testament to its quality. Of course, we can't have quality on TV - there's not enough T&A, violence, or out and out stupidity (think Jessica Simpson here). But for the 3 years this show was on, it was a real Friday night Feast. And I do thank Mr. Perlman and Miss Hamilton for the years they gave us and I thank Mr. Perlman for the CD of music and poetry from the show. It's still heart-wrenchingly beautiful to listen to Vincent as he narrates works by Matthew Arnold, e.e. cummings and, of course, the King of all poetry, plays and prose, Mr. William Shakespeare. It would be a miracle if CBS were to air a "reunion" movie but I think there will be a tropical heat wave in the South Pole before that happens. Too bad - it sure beats the stupidity of such shows as The Newlyweds, starring the aforementioned Jessica Simpson, or Reality TV, American Idol and the other slime that passes for decent television. Meanwhile, I'll be content with VHS copies of B&B or I'll wait patiently until the DVDs come out. 62 of 78 people found this review helpful. Was this review helpful to you?